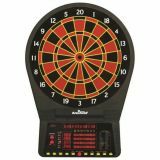 E-Bristle dartboard has 34 games/183 variations with 13.5" target area for steel and soft tip darts; door mounted backlist CricketMaxx X/O display; solo play feature, Heckler feature; integrated wood doors ideal for game room. 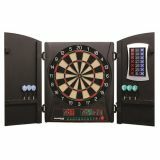 Dartboard has 39 games/179 variations with 4 player score display for up to 8 players. 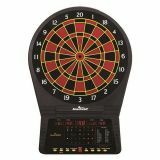 Optional 3-level Heckler, dart averaging for '01 games, micro-thin dividers, NylonTough segments, player handicap feature and single in/out and double in/out features.